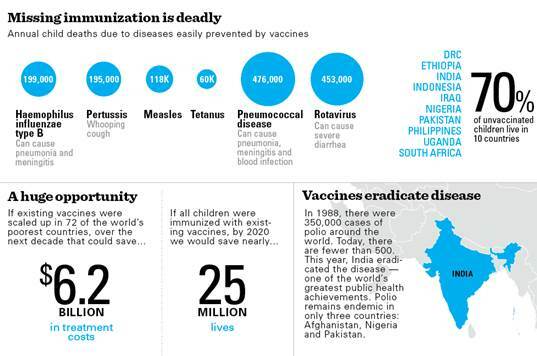 In honor of World Immunization Week, which is April 24th-April 30th, UNICEF has crunched some important numbers regarding vaccines around the globe. The World Health Organization (WHO) notes that, “Vaccines have helped to cut child deaths in half over the last two decades. Yet today, 1.5 million children under five still die every year from diseases that could have been prevented by vaccines.” UNICEF and WHO are using this year’s World Immunization Week, with the slogan “Immunization for a healthy future. Know, Check, Protect,” as an opportunity to remind families and communities how effective vaccines can be. The organizations have created some stellar infographics that allow parents, and others, to see issues and figures related to vaccines in a simple way and hopefully to help encourage people to take action in order to ensure that more children get immunized against deadly and debilitating diseases. Because we live in a time when vaccines are prevalent, it’s easy to forget that diseases used to wreak massive havoc. Keep in mind, that since immunization became the norm, we’ve averted 2-3 million deaths each year from diseases such as diphtheria, measles, pertussis, pneumonia, polio, rotavirus diarrhea, rubella and tetanus. Get the facts about vaccines in the infographic after the jump! In honor of World Immunization Week, which is April 24th-April 30th, UNICEF has crunched some important numbers regarding vaccines around the globe. The World Health Organization (WHO) notes that, "Vaccines have helped to cut child deaths in half over the last two decades. Yet today, 1.5 million children under five still die every year from diseases that could have been prevented by vaccines." UNICEF and WHO are using this year's World Immunization Week, with the slogan �Immunization for a healthy future. Know, Check, Protect,��as an opportunity to remind families and communities how effective vaccines can be. The organizations have created some stellar infographics that allow parents, and others, to see issues and figures related to vaccines in a simple way and hopefully to help encourage people to take action in order to ensure that more children get immunized against deadly and debilitating diseases. Because we live in a time when vaccines are prevalent, it's easy to forget that diseases used to wreak massive havoc. Keep in mind, that since immunization became the norm, we've averted 2-3 million deaths each year from diseases such as diphtheria, measles, pertussis, pneumonia, polio, rotavirus diarrhea, rubella and tetanus. Get the facts about vaccines in the infographic after the jump!